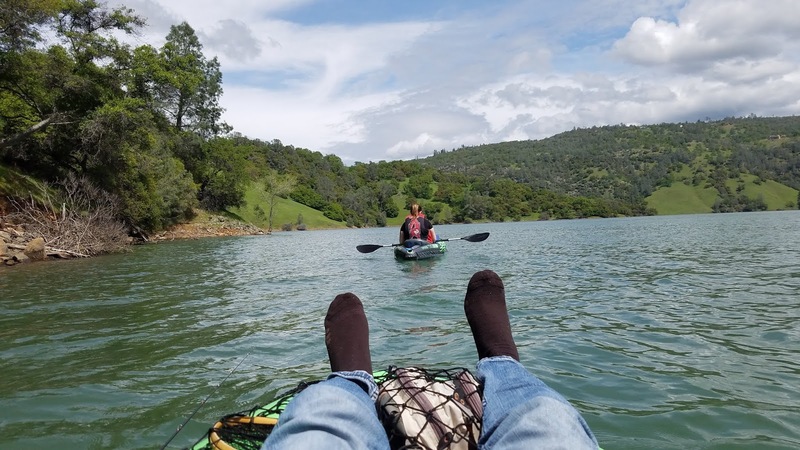 Lake Englebright is a relatively large lake that can be found near the Nevada and Yuba County border. It is the last reservoir in the Yuba River system and empties both under and at times over the top of the Englebright dam. This lake is better known as a trolling lake and is home to rainbow trout, brown trout, kokanee, and several different bass species. It also has boat in only campgrounds which I found very fascinating and cool. 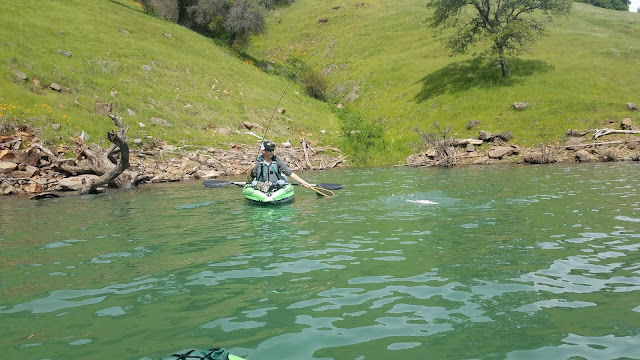 With new Intex Challenger K1 inflatable kayaks, the missus and I decided to take the day and test our new yaks to see if we bought kids toys or something worth keeping around and of course I brought along a fly rod to compare the difference between fly fishing from a kayak versus a float tube. Lake Englebright is more long than large. It would be near impossible to cover water effectively on a float tube out on this particular lake due limited launch options. After setting up our inflatable kayaks near the boat launch we were off to a good start. 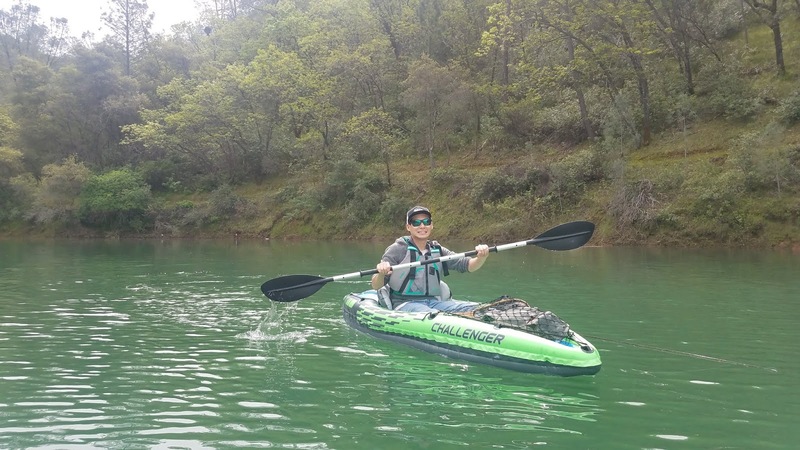 The Intex Challenger K1 kayaks worked very well and I was surprised on how well they tracked and how quickly we were able to get from one end of the lake the other. Overall we covered about five miles of water round-trip with ease. With no real knowledge of what the lake looked or fished like I was using my basic stillwater fly fishing skills. I knew that the lake was full and spilling over so the banks were going to be steep therefore I lined my reel with type IV full sinking line. The water was very cold so I guessed that the fish were going to be somewhere between the 5ft - 15ft range. The first cove I fished wasn't very productive so I put away my rod and we took the time to paddle around a bit. We eventually stopped at another cove and just chilled a bit soaking up a beautiful day and some sun. The cove looked nice so I lined my rod up to give fishing another try. I made casts towards the bank, let my line sink for a few seconds, and then retrieved it back at a relatively moderate speed. During one of my retrieves I thought I snagged the bottom but became excited when the bottom started moving. After a few minutes of play I landed my first kayak fish on a fly, a nice healthy Englebright rainbow. Don't leave fish to find fish. I found my next grab near where I had caught my rainbow. 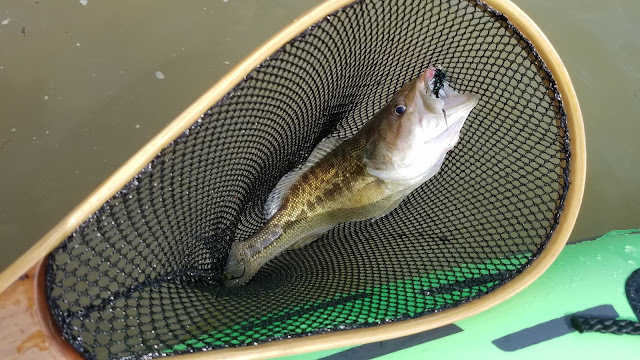 In came in what I was expecting to catch today, a spotted bass. This inflatable kayak opens a lot of new water for me and though it does come with it's challenges, such as trying to stay in one place while casting and retrieving line without dragging, it's not as difficult as many would make it out to be. I'm looking forward to mastering fly fishing on a kayak and catching a whole lot more fish.